I believe the only thing I love more than Halloween decorations are Halloween decorations that are cute and super fast to make! This BOO Banner is absolutely both of those, and a perfect Craft Lightning project. But that’s all felt! How on earth can it take you less than 10 minutes to make? Answer: I used my Cricut Maker. This post is part of a quick an easy blog hop using Cricut machines–you can catch all the entries for at the bottom of this post. AND, if you DON’T have a Cricut Maker? Make sure you make it to the bottom of the post to WIN a machine of your very own! Not to fear, though, I am going to include a pdf template if you don’t have one of these spectacular machines. It will just take a bit longer to put together. I have to thank my friend Carrie for the backgrounds here. We got out of Florida for Hurricane Irma, and her family was gracious enough to let us invade and use her house for pictures. And you read that right, yes, yes I did evacuate with my Cricut Maker. Cute, fast, and pretty inexpensive to make. Materials for this project should be less than $5. The felt I used for my banner was a little on the stiff side but it should work with softer material. First thing, you’ll need to cut out all your pieces! 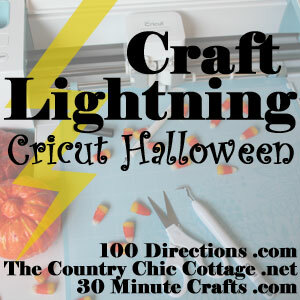 If you’re Cricut cutting this project, just download the free Halloween SVG file, then upload it into Cricut Design Space to make it. If you’ve got a Cricut Maker, I know there is some controversy over felt and the mats. I recently did a project where I cut about 25 mats worth of felt. I started with the pink mat which is specifically for fabric, but ended up on the green because it held the felt in place much better. For a thinner material, I would most definitely use the pink fabric mats. So this is your choice what to use, I personally just had more luck with the green. Cleaning–I used a piece of tape to rip up the fuzzies left by the felt. It worked well, but I hear using a big piece of extra sticky transfer tape to do this is also effective. If you’re going the hand-cut route, cut your shapes out from the pdf file and trace onto the felt. Use the photo below for a reference for how many of each need to be cut. Once the cuts are done, you’ll need your hot glue gun to put it quickly together. Lay the long rectangular shapes out and glue the ribbon across the flat top of the panels. The panels should be lined up black-white-white-white-black. Fold the small flap overlay over the ribbon and glue down in the front and back of each panel. White panels get a black flap, and black panels get a white flap. After the flaps are on the top, glue the letters and ghosts onto the banner. The ghosts go on the black banner, and BOO is spelled across the white panels. The ghosts have eyes and mouths, so make sure you get those glued to the ghosts. As an added bit of decoration, tie a bow from the ribbon and glue to the tops of the panels with ghosts. That’s it! Shouldn’t take but about ten minutes for it all to come together. Projects this fast make me love my Cricut so much!! Oh, my! I love everything about this adorable little banner! Cutest thing ever!! Thanks for joining! Love it! I can’t wait to try felt with my Maker! I love it, you took your Cricut with you! This is super cute Paula. Thanks, Jamie! It’s an easy decoration to make, too. Be sure to enter to win one of your own! What a great banner!!! Thanks for the ideas!! So adorable. I’m loving that I’m finding I actually have a crafter hidden inside me. This is super cute! I’ve got a Cricut Maker on my wishlist – I’m amazing at all the things it can do. Thanks for linking up with Merry Monday!